The Queens Historical Society is proud to present its second "Queensmark" awards, this time to College Point. This semi-annual program was created to honor those structures and sites in Queens communities that deserve special recognition because of outstanding architectural, cultural, or historical significance. 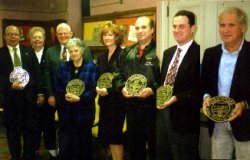 The first community so honored was Richmond Hill, in November 1996. 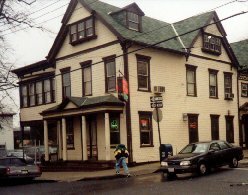 From January through April of this year, the Society's Preservation Committee did a survey of College Point, studying and examining its varied residential and commercial structures. By driving, walking, taking photographs, and ongoing discussions, the Committee finally narrowed its choices to twelve structures deserving of Queensmarks. Special beautiful bronze plaques are being awarded to the owners of the buildings. Queensmarks will be presented each Spring and Fall in a different Queens neighborhood. In each case, community groups and/or leaders are consulted. 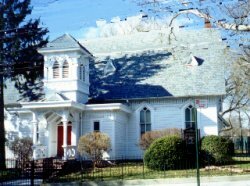 Queens Historical Society strongly feels that a Queensmark should maintain the high criteria that characterize a Landmark designation. 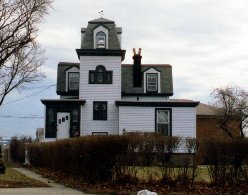 To that end, the Preservation Committee includes an architect, an architectural historian, researchers, and a landmarked Historic District leader. An ultimate goal of the Society is to increase the awareness and sensitivity of Queens residents to the Borough's heritage and history as expressed in its built environment, whether a house, a factory, a park, or a store. These, and various other structures, all present a story of the past, and, in their own ways, are as much a part of that past as any will, deed, or old newspaper clipping. By developing an increased pride in our borough, its various communities, individually, and collectively, can preserve our heritage, and secure it against unwelcome and unnecessary changes. Tour Richmond Hill, recipient of the first Queensmark Award!